As mentioned in David Clayton’s post on Monday, a Catholic Vespers was sung in the Chapel of Hampton Court Palace yesterday evening. This historic event was conceived and promoted by Genesis Sixteen, the outreach offshoot of The Sixteen, the well-known concert and touring choir. The Archbishop of Westminster, Cardinal Nichols, presided, and the music, sung by The Sixteen and Genesis Sixteen, included a Tallis Magnificat, Salve Regina by William Cornysh and John Taverner’s ‘Leroy’ Kyrie. For a non-Catholic choir to sing a Vespers from scratch is not easy (they were fortunate to have some help from Westminster Cathedral music department beforehand) even for a top-flight choir like The Sixteen. There is a rhythm and flow to the psalms which can only be accrued over time and is difficult to achieve ‘straight out of the box’. 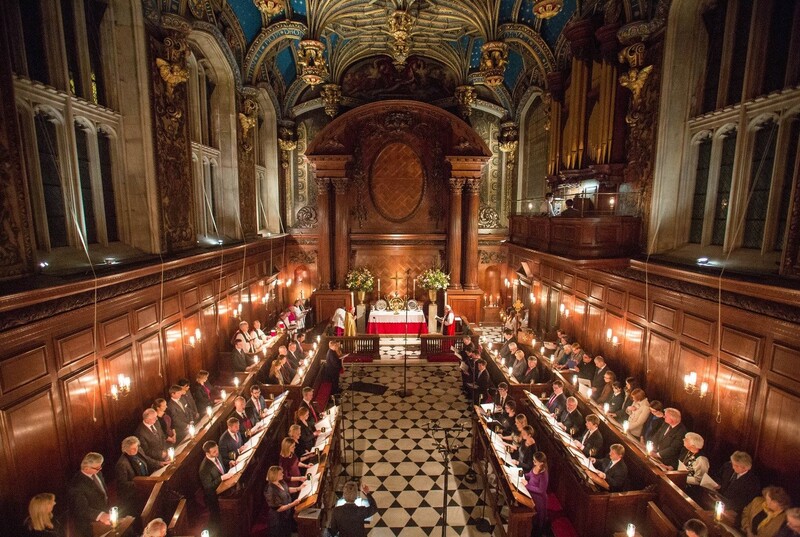 Genesis Sixteen, founded by a generous Catholic philanthropist, aims to give people of university age a launch into the professional world of singing. 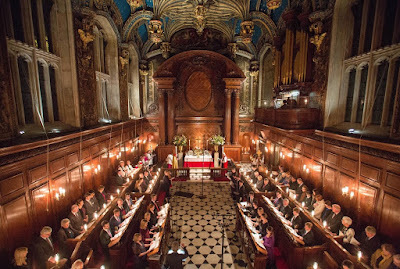 A few similar schemes have appeared over the past few years, including the Monteverdi Choir’s Apprentice Scheme, providing mutually beneficial arrangements for the host choir in terms of finance and publicity, as well as the obvious benefits for the young singers who audition to the requisite high standard. Vespers in the Chapel of Hampton Court Palace yesterday. However, sometimes philanthropy is needed in less obvious or visible situations, and sometimes philanthropists want to know where they can help. Towards the very end of the political TV drama series The West Wing, the Bartlett Administration is preparing to leave the White House and the senior staff weigh up their options and mull over various offers of employment from the private sector and other walks of life. Chief of Staff C.J. Cregg is approached by a billionaire philanthropist who tries to persuade her to head up his charitable foundation. He is determined to make a big difference and solve the problems of famine in Africa by bombarding it with aid. She explains to him that Africa’s problems are caused not so much by a lack of aid, but by a lack of roads. The solution therefore does not lie in flooding it with aid, but in building roads. With those roads, the aid can reach the places it needs to. This is the same experience I work to bring to the boys in the Schola at the London Oratory. These boys, who at Mass this morning in the London Oratory sang Allegri’s Miserere with its famous top Cs, sing a wealth of Catholic liturgical music. Soon they will have sung, in the space of two years, both of J.S. Bach’s settings of the Matthew and John Passions, his B minor Mass, his motet Singet dem Herrn and Monteverdi’s Vespers, to name some of their recent concert repertory. The girls and boys of the Oratory Junior Choir have a similar experience which requires of them the highest standards of singing at the Oratory’s liturgies. These liturgical choirs and others like them, which aspire to raise the musical standards and aspirations of Catholic children and young adults, need to be supported. They are as essential to Catholic Music as the roads in Africa, and there need to be more of them. (I was delighted to receive a letter from an NLM reader recently seeking advice about a children’s choir they are founding within a major Catholic institution in the USA.) Such choirs are not choral finishing schools. They do not get much publicity. They are fundamental, providing the bedrock support, the nuts and bolts of music if you will. They are founded upon hours of daily toil, and the considerable achievements of the children are earned through hard graft. There are no short-cuts, no quick fixes. And although it is at this age that attention and support most need to be given, most of these liturgical choirs are woefully underfunded. It may not be particularly glamorous to write cheques for replacement cassocks, or new copies of sheet music, or bursary funds, but those few good souls who do this, quietly and unnoticed, are building roads for the future.